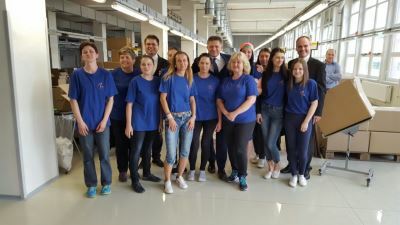 Rompa SK, our latest production site, recently welcomed an esteemed visitor at its new location; Robert Fico, the prime minister of Slovakia, personally visited our assembly site in Bardejov. Some of the employees working there even got a chance to shake his hand. The prime minister’s visit means that Slovakia views Rompa as a serious and long-term partner, which we are truly honoured by. This was not the first demonstration of that faith; our new building was completely renovated at the initiative of the Slovakian government and with support from the European Union. Besides politicians, the press also paid us a visit. The Slovakian television even showed a clip about Rompa SK’s new location on the news. Considering how welcome we are made to feel, Rompa is sure to have a bright future in Slovakia.